"Our records show we received a 1040X...for the tax year listed above. We're sorry but we cannot find it." "Our records show you owe a balance due of $0.00. If we do not receive it within 30 days, appropriate collection steps will be taken". "Payment is due on your account. Please submit payments on or before June 31st to avoid late payment penalties and interest." It's pretty tough to pay a balance due of $0 on June 31st when June only has 30 days. The message should be clear. If you receive a notice from the IRS do not automatically assume it is correct and submit payment to make it go away. The same is true for any state notices. They are often in error. So what should you do? Stay calm. Try not to overreact to the correspondence. This is easier said than done, but remember the IRS sends out millions of notices each year. The vast majority of them correct simple oversights or common filing errors. Open the envelope. You would be surprised at how often clients are so stressed by receiving a letter from the IRS that they cannot bear to open the envelope. If you fall into this category try to remember that the first step in making the problem go away is to open the correspondence. Careful review. Review the letter. Make sure you understand exactly what the IRS thinks needs to be changed and determine whether or not you agree with their findings. Unfortunately, the IRS rarely sends correspondence to correct an oversight in your favor, but it sometimes happens. Respond timely. The correspondence received should be very clear about what action the IRS believes you should take and within what timeframe. Ignore this information at your own risk. Delays in responses could generate penalties and additional interest payments. Correct the IRS error. Once the problem is understood, a clearly written response with copies of documentation will cure most of these IRS correspondence errors. Often the error is due to the inability of the IRS computers to conduct a simple reporting match. Pointing the information out on your tax return might be all it takes to solve the problem. Certified mail is your friend. Any responses to the IRS should be sent via certified mail. This will provide proof of your timely correspondence. 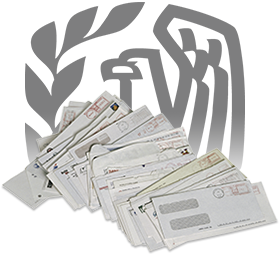 Lost mail can lead to delays, penalties, and additional interest on your tax bill. Don't assume it will go away. Until a definitive confirmation that the problem has been resolved is received, you need to assume the IRS still thinks you owe the money. If no correspondence confirming the correction is received, a written follow-up will be required.